Having just returned from Ghana I would like to give you a Ghana Storytelling update focusing on the latest project. As you know, my hope this year was to fund the provision of latrines in Anyako, a village situated on the lagoon and where there have been recent deaths from cholera. The very first project I was able to fund through Ghana Storytelling was with the fishermen/storytellers of Anyako. Two years ago, I was able to fund ten fishing boats and fifty nets with lead weights.These are all in regular use and helping the group and their immediate families enormously. However, in Africa, the whole community is considered as one’s family and so it seemed entirely appropriate that this time I should focus on providing a facility which will be of direct benefit to a large number of people in Anyako. After much discussion with Agbotadua Togbi Kumassah, my Ghanaian project partner, it was decided that we would try and build latrines andhelp reduce the incidence of cholera. And the building is under way! Togbi and I visited the village and chose a site on Monday, March 23rd, the first sacks of sand and cement arrived on Wednesday, March 25th and the work started forthwith. Togbi and I paid an ‘inspection call’ on Thursday April 2nd and were delighted to see the cement blocks made and drying in the sun and the ground being dug out. 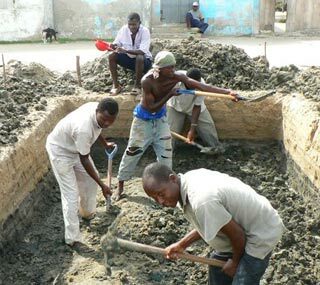 We shall eventually have eight latrines and there is currently enough money to do all the basic digging, building and plumbing for all eight. Four will soon be completed for use and the other four will be finished as and when funds permit. Without the generosity of all the people who have contributed to Ghana Storytelling, none of this could have happened and so it is with heartfelt thanks that I send you this information and photographic evidence. This growth in self-esteem is what your generosity has also funded. On behalf of all the storytellers, thank you. Anna – Monday April 13th 2009.